After nearly four decades in the industry, American thrash metal legends Slayer is currently on their last ever tour, bidding farewell to fans from different generations with an excessive tour across the globe. Since the formation in 1981, the band has been on the frontline of the blazing thrash metal scene alongside Metallica, Megadeth and Anthrax. Despite the band’s lyrics and artwork being somewhat, controversial, touching on subjects such as necrophilia, torture, genocide, murder, nazism and war, their music has been highly influential within it’s genre, with 1986’s iconic “Reign in Blood” being cited as one of the heaviest and iconic thrash metal albums. These subjects however, have not gone unnoticed and have generated album bans, lawsuits and critique from religious groups, all of which just fuelling the fans and the fury. After 37 years as a band, Slayer announced earlier this year that 2018 would set them off on their final tour which will be running through late 2018 before coming to an end in 2019. They just finished six dates across the UK, seeing mosh pits of people of all ages, sharing blood sweat and tears for their favourite band. Needless to say, we’re fans of Slayer here at The Great Frog and proud producers of the official TGF x Slayer ring, and we’re sad to see them go, but wishing them best of luck in their future musical adventures. Slayer’s Kerry King and TGF owner and designer Reino. 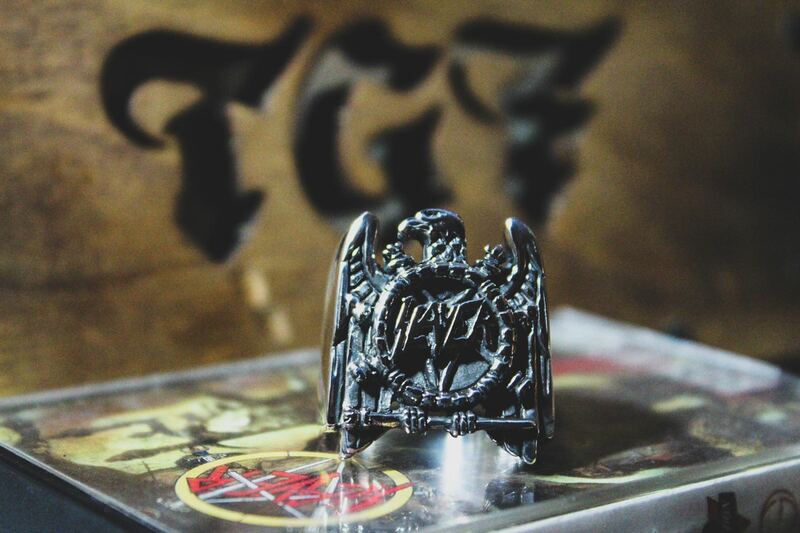 Buy the official TGF x Slayer ring here.